This engine was supplied new to Robert Payne, a well known showman from Beverley, Yorkshire in February 1921 to replace an earlier showman’s road locomotive (works number 3725) that he had purchased new from Burrell’s in August 1916. The new engine was given the works number 3878, along with the registration number BT 3997 and took the name ‘Excelsior’ from its predecessor. The new engine was painted in Crimson Lake with Red wheels, the canopy boards were lettered ‘R PAYNE, OUTDOOR AMUSEMENTS’ and a Davenport Hackett Ltd. P5-C dynamo was fitted. 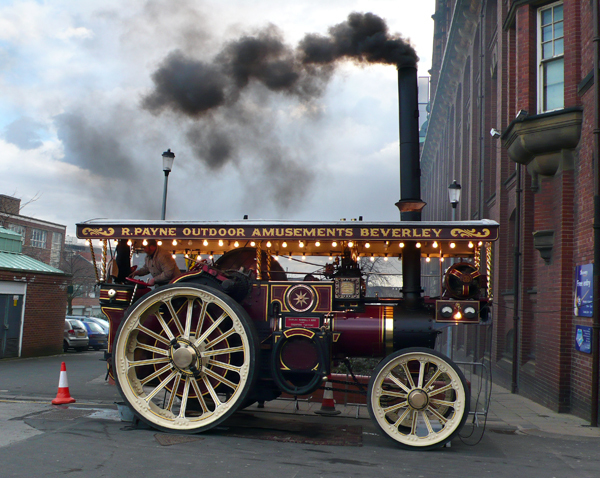 Mr Payne, who was born in Hull in 1857, used the engine with a large set of Savage three-a-breast Gallopers that were supplied new to the Presland family. Just prior to being purchased by Mr Payne this ride had been completely re-built by Savage’s for Bolesworth’s the well known London show family. In 1931 the engine was sold to Arnold Bros. Of Cowes on the Isle of Wight, who renamed it ‘Island Chief’ to match the other engines in their fleet such as ‘Island Queen’ and ‘Island Prince’. During the travelling season the engine would make many sea crossings between the fairs held on the south coast of the mainland and those of the Isle of Wight. During the Second World War it was used on gun haulage duties etc, then in 1949 it was sold to a Hampshire farmer for general agricultural duties. Eventually the engine was put to work by a market gardener for sterilising soil in his green house. Many people have fond memories of the engine in the early days of preservation for its time with Herbert Epton of New Bollingbroke, Lincolnshire and Arthur Mason of Burnham Market, Norfolk. In 1985 it was purchased by the Tarrant family of Horndean, Hants, who carried out a major restoration before rallying it for a number of years. It was the sold to Jamie Clark of Scarborough who travelled the engine extensively, often accompanying the other engines and organs in the collection. Graham Atkinson purchased the engine in late 2006 and decided to re-christen it ‘Excelsior’ in honour of its early working life in the County where it once again now lives.